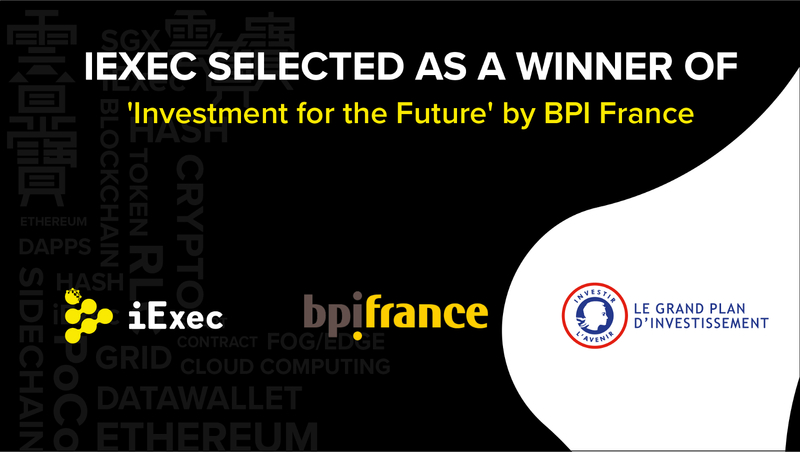 Lyon, February 20th, 2019: iExec was selected as a winner of the ‘Investment for the Future’ programme by BPI, a French public investment bank, to support the development of a blockchain-based cloud solution for enterprises. An amount of 2 million euros is to be invested in a project by iExec titled ETH4ETR (Ethereum for Enterprise). 45% of the funding is subsidized in the form of a grant from BPI (Banque Publique d’Investissement). The financing came as a result of iExec winning in the ‘Digital’ category of the ‘Investment for the Future’ programme (Programme d’Investissement d’Avenir), an initiative launched by the French Government, investing a total of 57 billion euros since 2010. The program awards innovative companies and serves to support the development of products with global reach that present significant potential for the French economy. The aim of ‘ETH4ETR’ (Ethereum for Enterprise) is to tailor the iExec offer for enterprise use. iExec is building a decentralized cloud on the Ethereum blockchain whereby anyone can share and monetize cloud computing and data resources. The transition from a public to an enterprise offering requires the creation of a private blockchain for consortiums. The existing iExec infrastructure will then be adapted to meet a high standard of security that fits the requirements for enterprise use on a large scale. This new offering brings value to a range of emerging industries by removing the tradeoff between confidentiality, speed, and decentralization of transactions. The solution can benefit sectors such as banking, insurance, scientific computing, 3D rendering or Artificial Intelligence. To realize this innovative ETH4ETR solution, the iExec team will apply its expertise in the field of cloud, distributed computing, and blockchain. The financial support from BPI will enable iExec to further strengthen both its IT and business development teams. About Le Concours d’Innovation: The Innovation Contest (Le Concours d’Innovation), funded by the State via the Large Investment Plan, and operated by ADEME, Bpifrance and FranceAgriMer, aims to support innovative projects led by start-ups and SMEs. It promotes the accelerated emergence of leading companies in their field, which can claim a global reach. As part of a procedure favoring competition, it selects innovation projects with particularly strong potential for the French economy. It thus makes it possible to co-finance research, development and innovation projects, whose total costs are between €600,000 and €5 million.